We tend to think of upper Parry arcs the way we see them at low sun. Two observations from the past months, however, show what they look like when the sun is high up in the sky. 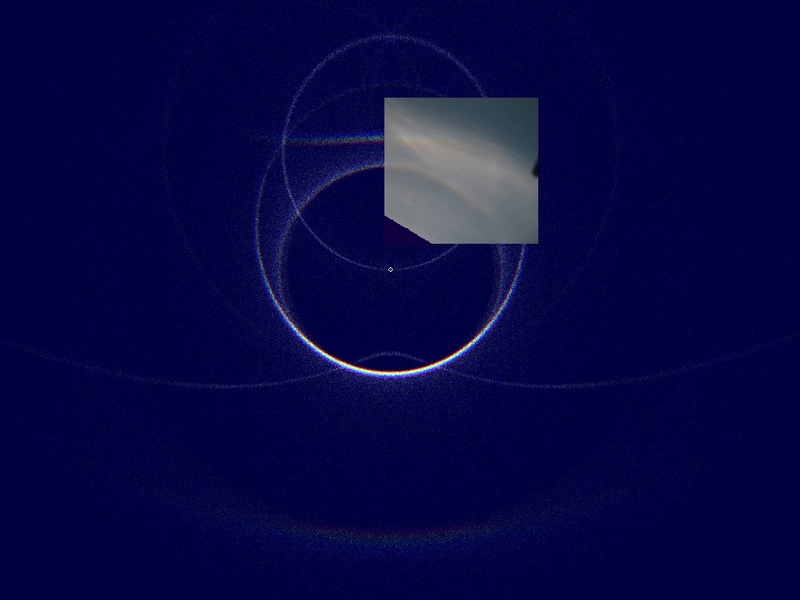 In the above image, we can see an almost straight-looking Parry arc photographed by Faber McMullen at 69° sun altitude. The image was taken in Navasota, Texas, on 8 May 2008. 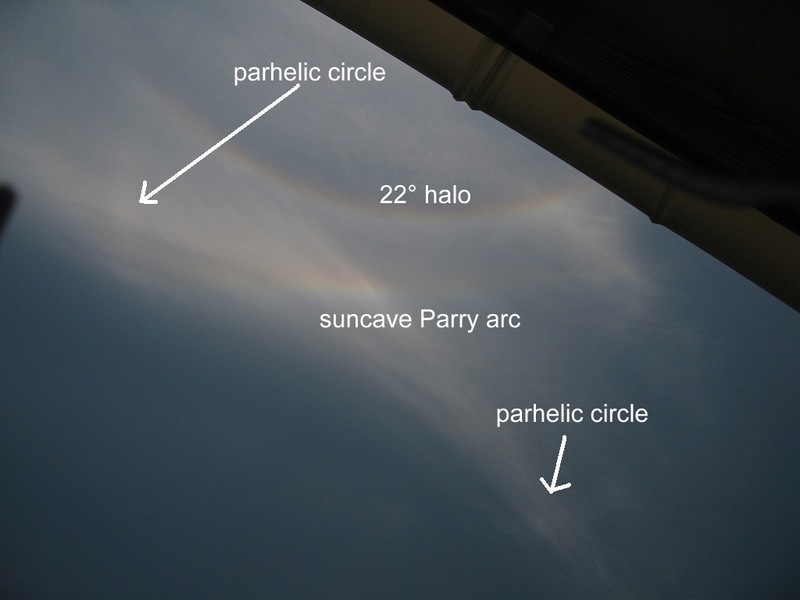 The Parry arc was accompanied by a circumscribed halo, and a parhelic circle that is faintly present in the pictures, too ( 1 ). He also made a simulation with Les Cowley’s and Michael Schroeder’s HaloSim, which helps to interpret the photo ( 2 ). The other observation comes from Holesov, Czech Republic. 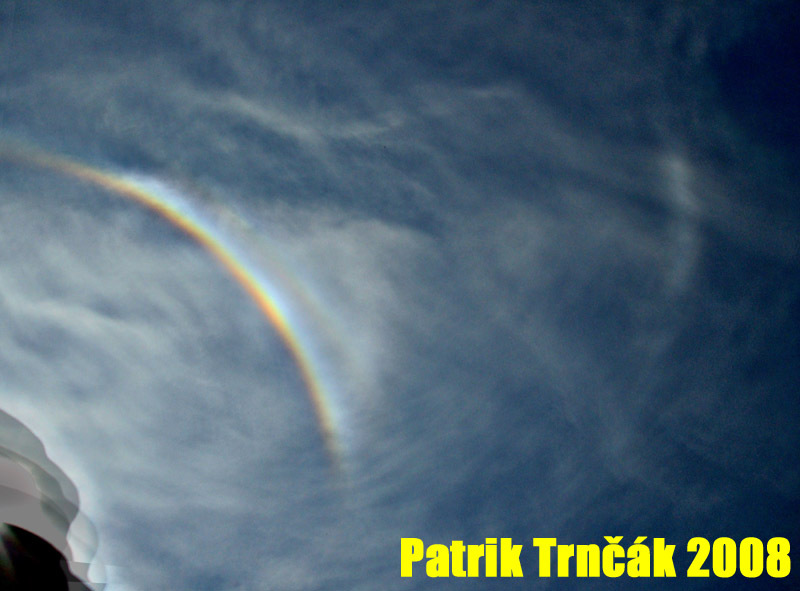 Patrik Trncak photographed a short-lived Parry arc at 61° sun altitude on 19 June ( 3 ). The circumstances were similar. The cirrus clouds produced a circumscribed halo and a full parhelic circle besides the Parry arc. Wow! Nice display! It is not common to see pictures of high sun Parry arcs. Faber McMullen's display is very interesting. When I look at the simulation, the lower suncave Parry arc may be visible on the pictures. After processing the pictures with unsharp mask, this arc appears faintly. The arc is faintly visible between the upper Parry arc and the parhelic circle, and in the top left on this picture. In France, I see high sun upper suncave Parry arc around once every 2 years. That is a nice high-sun halo display with upper parry. After seeing this on the blog it brought back a memory of a display I photographed while on lunch break in school. 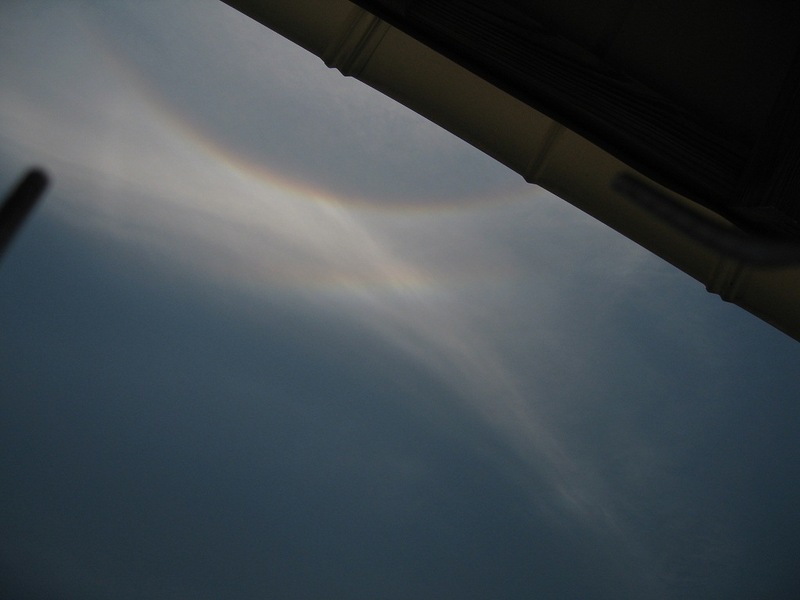 The display had 22d halo, sharp circumscribed halo, small and complete parhelic circle, infralateral arc, very fine circumhorizontal arc,and faint parry above the circumscribed halo. I need to look at photos closely to see it.